This is a recent painting that was inspired by a photo from my friend Lin Sons. 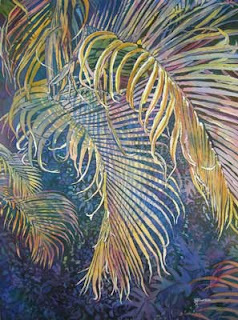 She took a photo of these frilly palm fronds in her backyard. Thus, I named this piece "Lin's Palm". This piece is done with my Layering/Pouring technique. It measures 23 x 30 inches and is framed in a gold metal frame. 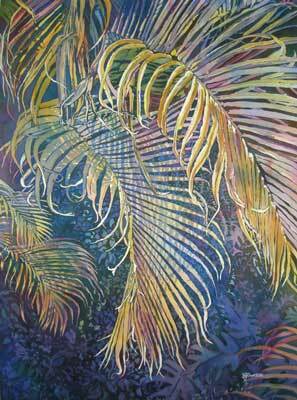 It can be seen in person at the Art and Antique Studio and Gallery on Highland Avenue in Melbourne, Florida. I really loved the lines and shapes in this piece. I also had fun working with darker values, especially in the background where some of the flora is almost hidden with glazes of blue. Let me know what you think!